Switzerland is a fun place to visit year-round, famous for its snow-capped mountains, amazing skiing and summer adventures. Couples can visit museums, historic sites and stay in hip hotels in Zurich, Bern or Geneva, or plan a quiet holiday in the mountains to celebrate an anniversary, birthday or another special occasion. In the winter, choose from small and large mountain resorts where you can ski on some of the most well run slopes in the world. Many travelers check into a health spa for a week of rejuvenation and relaxation. During the warmer season, play great golf in the mountains. Year-round, there are many luxury resorts and hotels to choose from in famous destinations like St. Moritz, Luzern, Basel, Zermatt and Melide. On your romantic getaway, pick the perfect spot for a wedding proposal or elope and get married with a view of a Swiss mountain lake. Badrutt's Palace is a luxury hotel surrounded by the Swiss Alps in St. Moritz, one of the world's top winter vacation destinations. Visit in December when the town gets festive in preparation for the holidays. The resort features a health spa, indoor & outdoor pools, tennis and golf. In the winter, enjoy challenging skiing, the Palace Ski School and natural ice rink with resident skating instructor. 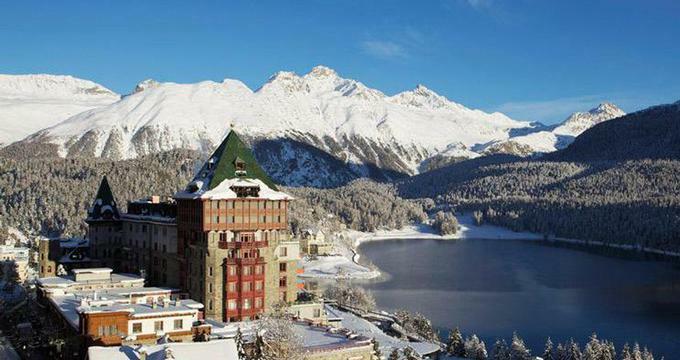 St. Moritz is a charming winter ski vacation destination, complete with gourmet restaurants and designer shops. 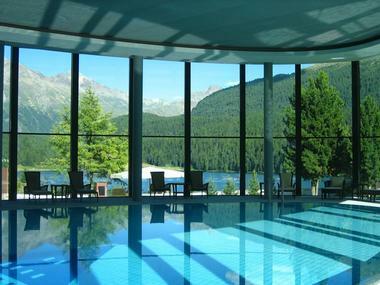 The St. Moritz area offers numerous vacation activities for outdoor enthusiasts. In the summer, a shuttle transports guests to two nearby golf courses with spectacular mountain scenery. There is also horseback riding, mountain climbing, tennis, biking, polo and sailing. The hotel's health club provides fitness classes and personal training. Summer activities in the area include opera performances, the St. Moritz Gold Cup golf tournament, the international windsurfing championships, and sailing regattas on the St. Moritz and Silvaplana lakes. Since it opened its doors in 1896, the hotel has been a favorite with celebrities and royalty. The hotel has 201 individually decorated guestrooms and suites with beautiful views of the Swiss Alps, the village or the lake. The spa employs the Daniela Steiner Skin Care System products to provide a range of relaxing, therapeutic and rejuvenating treatments. The hotel has several restaurant and bars. Le Restaurant serves elegant breakfast and dinner, while Le Relais offers bistro-style French delicacies. Stop at the Acapulco Snack Bar for a juice and a light meal, or sip tea in the Palace lobby. The Renaissance Bar attracts guests for aperitifs and nightcaps with its warm fireplace. In the summer, you can dine outdoors at the Mexican Bar or at the Acapulco Terrace which serves grilled dishes and salads. King's Club Discotheque is open from mid-July to mid-August. Room rates from Euro 139. The resort is open during the summer season from June 27 to September 22, and during the winter ski vacation season from December 4 to April 12. You can fly to Zurich Airport which is 2.5 hours by car from the hotel, Milan or Munich. If you do not wish to rent a car, Switzerland has an excellent railway system. Traveling by train will allow you to take in the beautiful scenery while somebody else does the driving. The hotel can make arrangements for transfers from the St Moritz Railway Station (+41-81-837-11-00). Mandarin Oriental Hotel du Rhone, Geneva is a luxury romantic hotel located on the right bank of the River Rhone in the center of Geneva's business and historic districts. 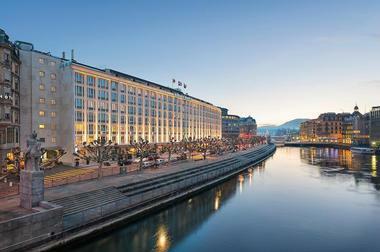 The hotel is a short walk from Geneva's historic old town and its theaters. The hotel has 192 guest rooms and suites, many with scenic views of the river. The elegantly furnished rooms feature art deco touches and Greek marble bathrooms. Chocolate lovers with delight in Creme de Gruyere chocolates served in the rooms on your luxury honeymoon. Guests can work out at the fitness center, indulge in a massage, and relax in the sauna and steam bath. There are four restaurants and cafes at the hotel. Le Neptune and Le Cafe Rafael both offer outdoor seating on the terrace. Rates start at 320 Swiss Francs. VacationIdea.com Tip: Check for packages and deals to save on your trip. The "Luxury Breaks" package includes a daily dining credit of CHF 50 per day, or CHF 100 if you reserve a suite. It requires a 2-night stay. Rates start at CHF 660. The "Suite Temptations" includes: free 4th night, breakfast, VIP amenity (+41-22-909-0000). The Beau-Rivage Palace is a historic spa vacation getaway on the shores of Lake Geneva in Lausanne, Switzerland. Surrounded by ten acres of parkland, the hotel enjoys scenic views of the lake and the French Alps. The building features belle epoque architecture, furnished with antiques and fine reproductions. The hotel has a European spa with eight treatment rooms, an indoor and outdoor swimming pool and a fitness center. For the ultimate indulgence on your spa vacation, book one of the two private spa suites. In the summer, Lausanne offers biking, sailing, tennis, golf and water-skiing on the lake. In the winter, there are several ski resorts a short drive away. Guest rooms and suites are individually decorated in a classical style. Ask for a room with a view of the lake and a Jacuzzi on your spa vacation. Luxury hotel services include 24-hour room service, a 24-hour concierge and twice daily maid service. During the warm summer months, sit on the terrace and enjoy the view. The hotel is 35 minutes from Geneva International Airport by train or by car. If you are traveling from Paris, take a train which takes about 3 hours and 35 minutes. Doubles start at € 310 per night (+41-21-613-3333). Grand Resort Hof Ragaz in Switzerland offers luxurious spa suites with in-suite saunas where you can detox and relax as much as you like in the privacy of your own suite. If you are planning a romantic getaway to Europe, treat yourself to couples massages at this unique spa. There are several different accommodations to choose from at Grand Resort. Ask about the Grand Hotel Quellenhof & Spa Suites when booking your stay. The resort makes it easy to travel with the whole family. While you are relaxing at the spa, kids ages 3 and older can participate in the children's program which includes painting, baking and games for kids of different ages. Babysitting services are also available. The spa has a Swarowski steam bath, a relaxing indoor hot spring and a number of spa programs. Enroll in a weight loss program or improve your sports performance. The thermal spa waters are healing and rejuvenating, perfect for a relaxing European vacation. There are a variety of dining options at the resort, ranging from refined dining to casual eateries. Choose from a total of 8 restaurants, some of which are perfect for couples while others are great for families. Äbtestube is a gourmet restaurant serving delicious cuisine with top wines. The restaurant specializes in Regio Nova cuisine with dishes such as bison from Canada. Restaurant Bel-Air serves amazing spa cuisine, including delicious Japanese dishes. There are two beautiful golf courses at the resort, including an 18-hole PGA Championship Course which has hosted the annual European Seniors Tour for more than ten years. After a round of golf, have lunch on the Golf Restaurant terrace enjoying the views. The 9-hole Executive Course with Golf Academy is a great place to learn how to play golf in a relaxed setting. The 9-hole course is a great place to polish your short game. Rates start at 440 Euro for a Junior Suite (+41 (0)81 303 30 30). Hotel de Trois Couronnes is situated along the shores of Lake Geneva in the old town of Vevey, also referred to as the chocolate capital of Switzerland. Its strategic location offers quick access to Switzerland's top attractions such as a chocolate factory, Gruyere town, and Lavaux Vineyard Terraces. The hotel has a total of 71 elegantly appointed guest rooms, including nine Junior Suites and 16 Suites. Ask for one of the 34 rooms and suites which are oriented southwards overlooking Lake Geneva and the Alps. Restaurant Les Trois Couronnes has a terrace overlooking the lake and the Alps and offers Mediterranean and fine local cuisine. Spa Lounge serves light, healthy meals. The Veranda Bar entertains guests with live music, cocktails and light snacks with views of the lake and the Alps. The Puressens Spa is the hotel's wellness, health and balance center that embraces a zen environment. The facility houses the Joelle Ciocco Epidermiologic care center. Swim in the 24-meter heated indoor swimming pool with underwater music, relax in the sauna and whirlpool. There are 9 treatment rooms where you can get a variety of massages, body wraps and more. The spa offers fitness courses, including Pilates and body sculpting. A 9- and an 18-hole golf course are just three kilometers from the hotel. The hotel is home to the Montreux Jazz Festival and families can witness its festivities when booking in July. For sports lovers, a tennis court is just a five-minute walk away. Water sports can be organized upon request. The hotel offers sight-seeing tours for families. The hotel has a wedding organizer that assists couples with their wedding plans. Room rates start at 243 Euro per night (+41 21 923 32 00). Riffelalp Resort is a secluded mountain hotel near the ski town of Zermatt. The hotel is surrounded by hills, dense forests, and snow or green fields, depending on the season. The resort is set in one of the most scenic spots in Europe. 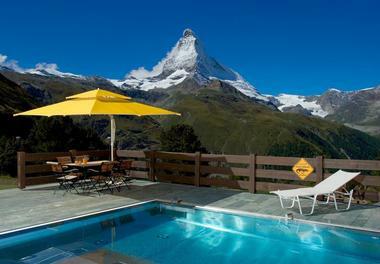 Guests enjoy direct views of the Matterhorn from the rooms and suites. Those who love nature, solitude and skiing will fall in love with this resort instantly. The ski hotel has a private tram and ski-in/ski-out access to the slopes of Zermatt. There are 65 rooms, 5 suites and 2 apartments at the resort. Each room has been individually decorates with warm fabrics and woodwork. Inside, you will find plush sofas, whirlpool tubs and Wireless broadband Internet. Ask for a room with a balcony to enjoy the best mountain views on your ski vacation. 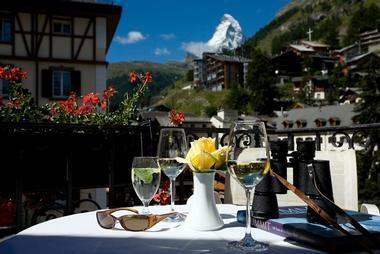 The resort has some of the finest restaurants in Zermatt. You can head to Al Bosco's sun terrace during the day to have lunch with a view of the mountains..
"Alexandre" and "Walliser-Keller" are open for dinner. Walliser-Keller serves local delicacies like Raclette, meat dishes over hot stones and Fondue. The resort has several bars and lounges, including the Mark Twain Lounge, piano bar in the lobby and the Vinothek which offers wine tasting. Savor wines from Valais on Mondays, from Italy on Wednesdays, and from other parts of the world on Fridays. The spa at the Riffelalp Resort is pure bliss. There is an indoor pool with a whirlpool, and a choice of saunas. The outdoor pool is among the highest in Europe. Room rates start at 750 Euro per night. The rate includes: half-board in the resort restaurants and Dine-Around at the Seiler Hotels in Zermatt, train to Zermatt and free night train from the village to the Resort (+41 27 966 05 55). 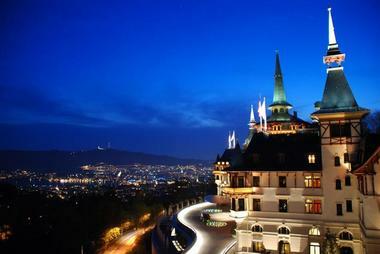 Lausanne Palace and Spa is a luxury property located on one of Europe's most famous lakes: Lake Geneva. The hotel is close to the best attractions in Lausanne: Palais de Beaulieu, International Olympic Committee and the Olympic Museum. This luxury 5-star property is just 500 meters from Lausanne Cathedral and the Historical Museum. This is a fine getaway for everybody who wants to spend a few days in luxury with stunning views of the Alps, forests and the lake all around them. There are 31 suites and 116 bedrooms. Ask for a room or a suite overlooking the lake for the most dramatic views. Each room has been individually decorated in classical style. Luxuries like marble fireplaces and spacious layouts make this property a great place to stay. Specialty suites include: the Coco Chanel, Samaranch, Contemporary, Presidential, Corner, Deluxe and the Classic Suite. Choose from four distinct restaurants. Table d'Edgard is sober and chic with its fabrics, wood and leather decor. The Brasserie serves traditional Parisian delicacies. You will get sauerkraut, beef entrecote, onion soup, pot-au-feu and more. Cote Jardin has tables on a terrace with stunning views of the Alps and the water. It serves Mediterranean cuisine with flavors from Greece, Spain and Morocco. Palace Sushi Zen serves traditional Japanese food. The Cellier is a vintage treasure. Swiss wine from Geneva, Valais and Lavaux is carefully preserved here for the true connoisseur. There are treasures from Lavaux and Burgundy as well. The cellar stocks wine from Chile, California, South Africa and New Zealand. The spa offers a range of wellness services including the CBE Concept Spa which is acclaimed throughout the country and beyond. Each wellness program can be tailored to the individual requirements of a guest. There are a Hair Spa massages and the Yogi Booster for balancing, energizing and nutrition. The Banquet room is a popular destination for weddings and receptions. Choose from several marriage packages. Doubles start at 360 Euro per night (+41 21 331 31 31). Located in the charming village of Andermatt in the Urseren Valley in the Swiss Alps at 4,747 feet (1,447 m) above sea level, The Chedi is a magnificent five-star luxury resort that offers 123 opulent, modern rooms and suites. The hotel has an unusual blend of Asian and Alpine décor, with a mix of leather and stone in its rooms and spacious yet cozy common spaces where large fireplaces invite guests to relax after a day on the slopes. It has four gourmet restaurants, bars, a health club, and a full-service spa. There is an outdoor swimming pool for the warmer months. The Nätschen ski lift is just next door, as is the Andermatt train station, ready to take the resort’s distinguished guests to the surrounding ski slopes and villages. The newly-renovated 5-star Mont Cervin Palace hotel is located at the foot of the Matterhorn in the heart of the pedestrian-only village of Zermatt in Switzerland. Winter in Zermatt is a dream come true for those who love skiing, snowboarding, skating, sledding and other snow sports. For a better well-being and long lasting relaxation, treat and soothe your mind, body and soul at MCP Spa. The Swiss spa offers massages, facial, body, hand and foot treatments using high quality products. MCP Spa in Switzerland has an outdoor pool open year-round, an indoor pool and two whirlpools with views of the Zermatt Mountains. Relax in the Finnish sauna, steam baths, and relaxation rooms with heated loungers. Work out in the fitness room to get in shape for the ski season. The hotel has three room categories to choose from: Alpine, Chalet and Chalet Family. The rooms and suites facing North offer views of the snow-capped mountains while the units facing South provides panoramas of the Matterhorn. Le Restaurant has a cozy atmosphere that serves charcoal-grilled market-fresh meat and fish accompanied with a very impressive wine list. 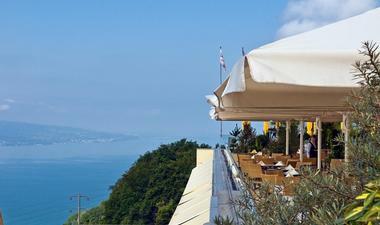 Gourmet dining of Mediterranean cuisine is prepared at the Ristorante Capri with views of the Matterhorn. Bar Le Petit Cervin opens only during winter and serves up to 30 guests offering some of the best wines in the region. The Rendez-vous serves tasty cocktails, wine, beer and selected dishes amidst soft piano tunes, dance music and acoustic sounds. For cigar enthusiasts, Davidoff Lounge is the ideal place, serving a vast choice of Cuban and Dominican cigars beside an open crackling fireplace. Winter activities include skiing in Zermatt, ice climbing and paragliding. In the summer, hike on 400 kilometers of marked hiking trails in the Swiss mountains. Families receive a 20% discount on the regular room rate including breakfast for children under 16 who are staying in their own room. Child care services are free and children 2 to 8 years old are treated with fun activities at the Nico's Kids Club. Guided walking tours are offered in Zermatt during the summer while a range of snow activities are offered during the winter season. Plan your wedding and other special events at the hotel which offers a tailored package for every occasion. You can select from a variety of reception rooms accommodating between 15 and 350 people. Room rates start at $1,585 USD per night (+41 27 966 88 88). Fairmont Le Montreux Palace is a spa and culinary getaway on the shores of Lake Geneva. Built in 1096, the hotel offers personalized service and sweeping views of the Swiss Alps. 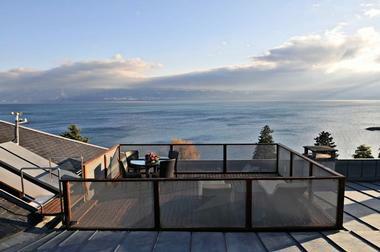 The property is an hour's drive from the Geneva Cointrin International Airport. There are 236 rooms, including 185 guestrooms and 51 suites furnished with five star amenities. Ask for a room with a veranda overlooking the water. La Terrasse du Petit Palais has views of the lake and the Alps. The restaurant serves lunch and dinner of salads from the resort's organic garden, as well as fresh meat and grilled fish. Enjoy refreshments and ice cream during afternoons. La Palmeraie overlooks the mountains and the lake and serves light snacks, coffee, tea and fruit juices. Swiss specialties and international cuisine is offered at the hotel's gourmet brasserie, La Brasserie du Palace. For a late Continental breakfast, aperitifs, home-made dessert buffets and afternoon tea, the Lobby Lounge Bar is a great choice. The elegant Harry's New York Bar serves a wide choice of cocktails and an a la carte menu of cuisines from around the world, while live music entertains diners. The 10-treatment room Willow Stream Spa has a Jacuzzi, hammam and sauna. The indoor pool is great for exercising and relaxing before your treatment. Golf de Lavaux is an 18-hole, par-72, 6,678-yard golf course, carved from 153 acres of erstwhile farmlands in Puidox-Chexbres. With its strategic location in the heart of downtown Montreux, families can enjoy a day of sightseeing trips in the charming city. Attend the famous Montreux Jazz Festival and the celebrated Christmas Market or simply relax in the hotel's outdoor swimming pool. The Belle-Epoque Ballrooms and the modern Coupole function room can accommodate 12 to 1,200 guests. Room rates start at 339 CHF per night. 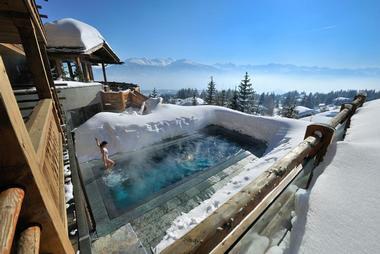 Le Crans Hotel and Spa is a chalet-style getaway in the Swiss Alps. The boutique hotel has just 15 suites and apartments, providing its guests with the ultimate in luxury and privacy. 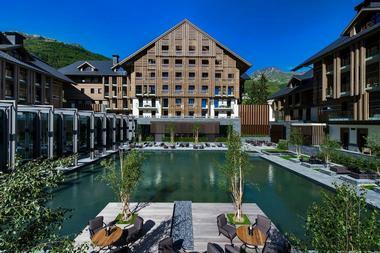 Relax next to the indoor or outdoor pool, get massages at the spa and enjoy breathtaking views of Mont Blanc. 15 suites and apartments have private terraces overlooking snow-capped Valais peaks and thick forests. Each bedroom presents a different interpretation of a mountain theme. 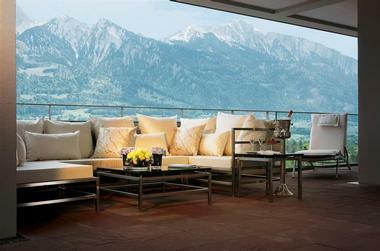 Rotunda restaurant offers mixed grill or brasserie dishes on the terrace looking out on the Alps. LaTable d'Hotes and LeCellier are two dining venues that allow guests to experience dining at the heart of the hotel's kitchen, served in person by the chefs. Taste a selection of the finest local and imported vintage wines. Choose from among 48 of the best red and white wines from Switzerland and from around the world at LaVinotheque. LeCigareLounge is a private club which offers a selection of cigars and drinks in a cozy ambience. LeSpa is inspired by the surrounding mountains and the the elements of wood, stone, fire and water. A mix of Western and Eastern treatments, hammam, massages, a hot tub and auna pamper both the body and mind. Guests receive a complimentary green fee pass for play on the 18-hole, par-72 Severiano Ballesteros Golf Course in Crans Montana. Rates start at CHF 430. Ask about the free ski pass during certain winter months (+41 (0)27 486 60 60). Le Mirador Kempinski Lake Geneva is a luxury lakeside retreat which offers vacationers spectacular views of the Alps and Switzerland's only Givenchy Spa. The hotel is located in the heart of the rural region of Lavaux, between Lausanne and Montreu, surrounded by lush vineyards of Chardonne and views of Lake Geneva. The Lavaux region and Montreux Riviera offers cultural festivals throughout the year. Ask for a room with a balcony overlooking Lake Geneva. The hotel has a mix of 67 modern and classical guest rooms and suites with natural lighting and earth-colored decor. Begin each day with a hearty breakfast buffet at the Horizon Restaurant with views of the Alps and the lake. Le Patio offers casual Mediterranean buffet meals. Au Chalet serves rich and authentic Swiss cuisine. Delight in the artistic culinary offerings of catch-of-the-day fish from the lake and seasonal dishes at Le Trianon. The red-carpeted Piano Bar entertains you with its lively music and a choice drinks from its vast collection of superior champagnes and vintage whiskeys. The naturally-lit spacious spa offers head-to-toe cleansing beauty rituals and treatments devoted to purification, rejuvenation and complete well-being. Le Mirador Medical Center provides customized healing and preventive medical programs to restore your inner balance. The fitness gym and exercise room offer state-of-the-art equipment and exercise classes like yoga, aerobics and Pilates. Golf enthusiasts can book tee times at the 18-hole Golf de Lavaux championship golf course just minutes away from the hotel. The scenic course is located above the hills of Lake Geneva and has a six-hole practice course with scenic views of the vineyards. The hotel has a gym, indoor and outdoor pool and three tennis courts. The hotel can arrange Nordic walking accompanied by trained guides. Private helicopter charter is available to explore the Alpine peaks and Lake Geneva. Get married with spectacular lake views while the hotel wedding planners take care of the details, including horse-drawn carriage rides, flowers and wedding photography. The hotel offers five spacious venues which can accommodate weddings of up to 300 guests. Room rates start at CHF 300 per night (+41 219 251 111). 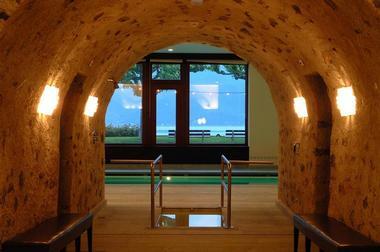 If you are looking for a classical European spa vacation experience, visit The Dolder Grand in Switzerland. The luxury five-star resort was originally built in 1899 and features the spa concept by Sylvia Sepielli. The building exterior looks like a picture-perfect castle you would find in a Disney movie, complete with white walls, wooden details and high towers. The hotel has 173 luxury rooms and suites in the main building and two wings. Traditional accommodations are located in the main building, while the wings house more modern-style decor. The hotel spa a swimming pool with scenic views, fitness and movement studios. Soothing modern decor creates a relaxing space for the body and mind. The extensive spa menu includes several world-famous product lines such as La Prairie, Amala and Kerstin Florian. Unique therapies include the "Meditation Walk" under a mirrored cupola. Room rates start at 349 Euro per night. Whitepod is a unique mountain getaway offering 15 large cozy tents with awesome views of Lake Geneva. Each tent features a large bed, soft carpet and is decorated with unique objects from the region. Scandinavian designed bathrooms and wood burning stoves complete the experience. At the center of the tents is a wooden chalet with a central fireplace. Switzerland is very efficient and traveling here is as easy as it gets. If you need additional information, Switzerland Tourism offers great maps, tips, apps for your phone and other travel tools. Getting There: Fly to Zurich or take a train from other parts of Europe. There are many flights from major U.S. and international cities. From Zurich, take the train to your destination. Do I Need a Visa to Enter? : Switzerland is a part of the Schengen Area which means that a US citizen or Green Card holder can travel there for up to 90 days. When to Go: Go in the summer (June to September) to enjoy an array of outdoor activities, and in the winter (mid-December to mid-April) for skiing and snowboarding. Some of the best deals can be found in April, May and October. When you decide to travel to Switzerland will ultimately depend on your activities. July and Auguest are the peak season and accommodations are the most expensive. The airfare from the U.S. to Europe is the most costly then as well. The Weather: The weather can be unpredictable, especially in the mountains, so it's a good idea to be well prepared when planning outdoor adventures. In the summer, temperatures range from 60 F to 86 F (15 C to 30 C), in the winter from 25 F to 45 F(-2 C to 7 C). Rain can come out of nowhere in the mountains. What to Bring: Summer hiking gear should include comfortable clothing and shoes, sunscreen and a reusable water bottle. You can rent high quality skis, ski boots and snowboards at most mountain resorts. Airport information: Zurich airport is very efficient, so you should have no problems arriving and departing. Keep in mind that you will have to go through immigration if flying from a U.S. airport. If you plan to travel by train, remember to purchase a rail pass before you go. Public transportation is a very good alternative to renting a car. Although Switzerland is often thought of as a luxury destination, you can find great options for a range of budgets. Here are some common travel expenses to help you estimate the cost of the vacation. Hotel Prices: Expect to pay over 100 Euros for a hotel room in a major city, and from 30 Euros for a dorm room at a hostel. Airfare: During the high season, flights from New York City, Boston and Chicago can cost over $1,000 USD per person, but during the shoulder season you can find tickets for $600 USD. Flights from West Coast cities like Los Angeles and San Francisco to Zurich or Geneva cost over $1,200 USD. Daily Expenses: Expect to spend at least $50 - $100 USD per day on food. If you plan to eat at hotel and resort restaurants, look for meal plans that include lunch and dinner. Look for specials like kids eat free. Extra Activity Expenses: Ski lift ticket prices can add up, so look for 3-, 5- and 7-day passes to help you save on vacation. Museums cost about 10 Euros and tours about 50 Euros. Once you add up airfare, hotel room costs, food and activities, a vacation in Switzerland won't be cheap, but this incredible country is a must-see destination. Zurich: The Swiss National Museum in Zurich features stunning chateau architecture and houses art from ancient through modern times. Interlaken: Go on a scenic hike to Giessbach Waterfalls or take the funicular. Basel: Swim in the Rhine River in the summer and take a romantic walk over its bridges. Bern: The Einstein House is where the famous physicist lived and worked. Most hotels and resorts offer specials at different times of the year. If your travel plans are flexible, avoid traveling during Christmas, New Year's and other major holidays and look for shoulder season specials. Below is a sample of deals and packages to look for in Swiss cities and resort destinations. Family Packages: Families can save with package that include access to a kid's club, meal plans and two-for-one room deals. Save on Rooms: There are two way to save on rooms: look for last minute specials or book well in advance. If you choose the second option, the advance purchase rooms are often non-refundable so be sure to purchase good travel insurance in case you have to cancel or postpone your trip. Air Travel Deals: Look for off season airfare deals in October, early November, early December, January and April. The best way to get a deal in Switzerland is to find flexible with your travel plans.